Apollo Horticulture understands that proper lighting is essential for healthy plant growth. Our new innovated and easy to install LED Grow Lights do just that. Compared to other grow lights, LEDs are attractive because they do not require ballasts and produce considerably less heat. 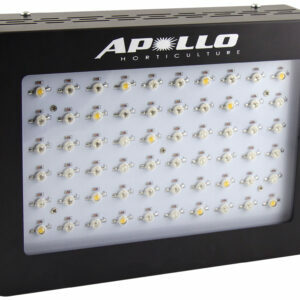 This allows Apollo Horticulture LEDs to be placed closer to the plant canopy than other lights. Apollo Horticulture LED Grow Lights come with an impressive average life span of 50,000 hours and a limited 2 Year Warranty. Not all LEDs are created equal.